Facebook groups are best place for any discussion with your own choice friends or other members. No one from outside can interfere in group without admin permission means groups are totally different from pages. In pages every person is free to like page. Groups can be secret, closed or public. But the problem we face in groups is that, we have to add all member manually one by one. Which is time consuming process. As in my recent post i discuss about Invite All Friends to Like Facebook Pages. Which is helpful for inviting too many friend to Facebook page within few secs and its totally time saving method. But that process is only working on Facebook page not on Facebook group. 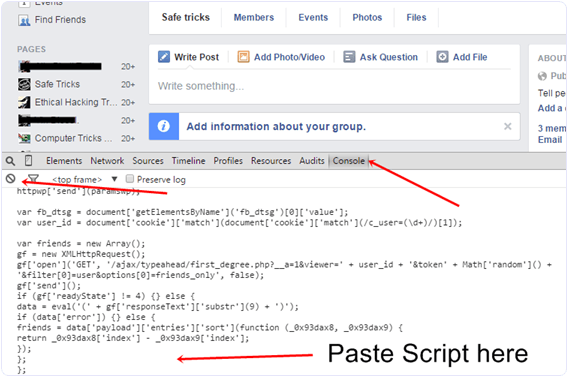 Today i will discuss about method to add member in Facebook group. Sometimes we had an account with 5000 or less friends. So its not an easy task to add too many friends and you face difficulty while adding them one by one. Don’t worry we care about your precious and so here is simplest and easiest way which will help you to add friends into group within few min by single click. First of all Log in into that whose friends you want to invite. Then open your Facebook Group in which you want to add friends. Now Click F12 button to open debugger and then select console box. Now copy script from below given button. Copy paste the whole provided code and then paste them into console box. Press enter and process will start for sending invitation. Note:- Don’t worry about anything this script is totally safe. In case you have too many friends then you get blocked for using groups or even your account may get locked. So be careful. If Face any type of problem and want any type of suggestion just feel free to share your comment.